Throughout the nation, and the world, the role of metropolitans is becoming more pronounced. Due in part to political gridlock in D.C., metropolitans have become living incubators for ideas and innovation. Although the rise of the metropolitan region can be seen by anyone who picks up the paper or flips on the T.V., it’s the Brookings Institute that has given this movement new momentum. San Diego is one region to embrace this "metropolitan first" ethos. 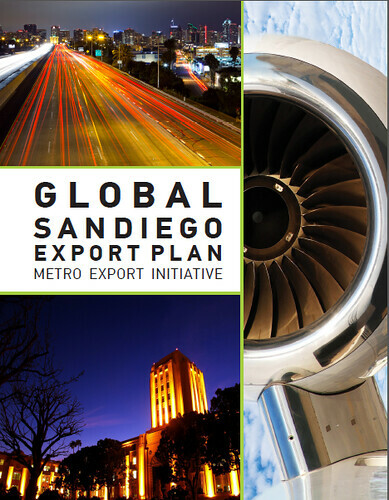 This week, EDC – along with numerous regional partners – released the “Global San Diego Export Plan” which focuses on growing our metropolitan economy and creating jobs through exports. The release of the export plan is part of San Diego’s continued participation in the Global Cities Initiative, a joint project of the Brookings Institute and JPMorgan Chase & Co. In 2012, San Diego was selected by Washington-based Brookings Institute as one of the first eight U.S. cities to participate in a national initiative to pioneer new strategies that boost exports and global economic competitiveness. The Global Cities Exchange has now grown to include 20 U.S. metropolitan areas. A focus on exports means a focus on all sectors of San Diego’s economy, from the established defense and communications sectors to emerging industries such as craft beer. Companies that export not only grow faster, but are 8.5 percent less likely to go out of business. Additionally, if you work at a company that exports, on average, you will earn a 10-20 percent higher wage than you would if you worked at a company that didn’t export. A newly-formed Global Competitiveness Council, comprised of key leadership from the Core Team Partners including elected officials and university leadership, will move forward on implementation of the strategies and provide insight into the region’s trade and investment plans. In San Diego, we’re not just exporting San Diego products; we’re exporting San Diego culture as well. Core Team Partners have included a Global Outreach component to encourage San Diegans to adopt a more global mindset and use this initiative as a platform for communicating San Diego’s global fluency. In the coming weeks, the Core Team will continue to push out information regarding San Diego’s plan to increase exports. More statements can be found here.